When I started coming down on my annual LA adventure, it was a 3-nighter. Ben would pick me up at the airport on Thursday night and I’d usually find dinner by myself and then he’d drop me back off at LAX on Sunday night or very early Monday morning. Somewhere along the way, I’ve worked this trip to last 5 nights. And I’ve learned to pack a lot of adventure into my 5 days away. 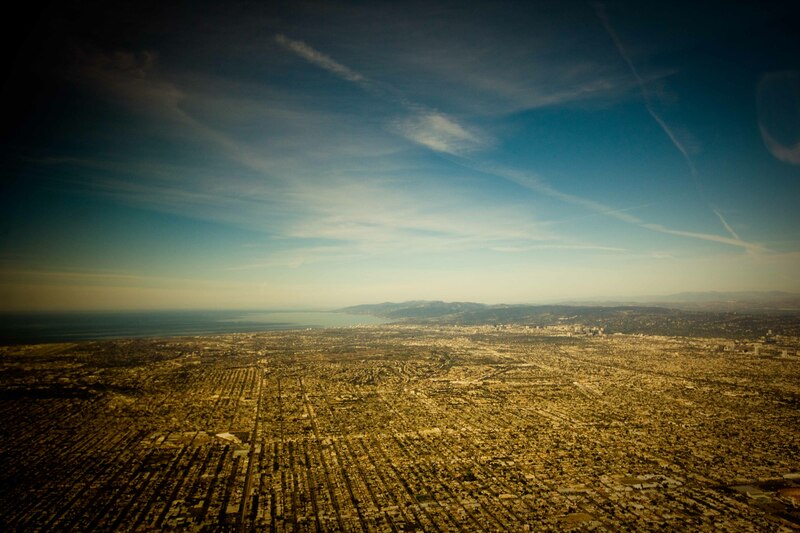 Landing in LA, eagerly anticipating 5 days of awesomeness. After we land on Thursday morning, Ben and Ross pick up a car and go to the hotel to check-in. They’re off to meetings which leaves me free to do whatever I want to. By then it’s lunch time, so my first stop is the Grove and to the Farmer’s Market. 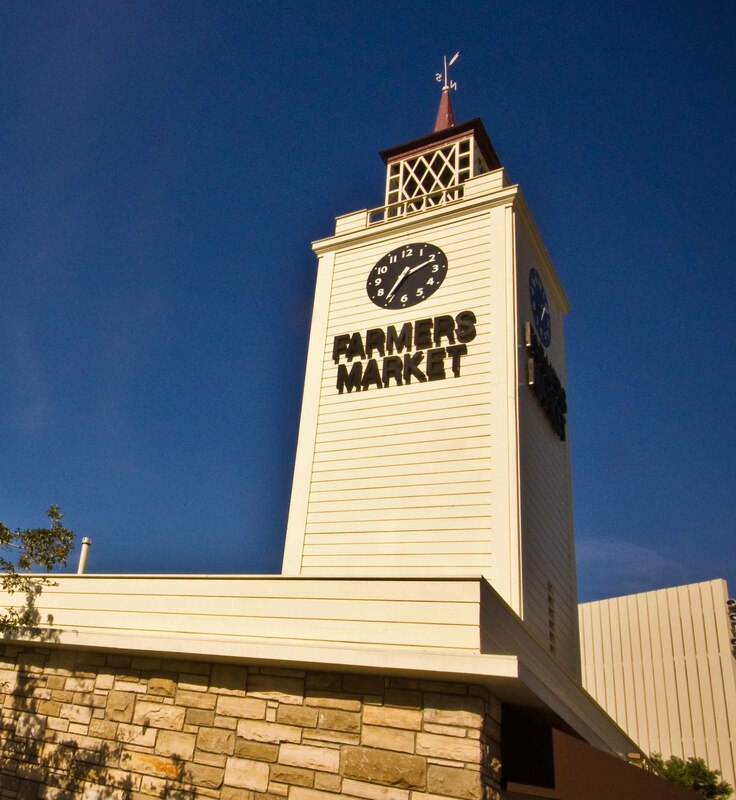 I'm always excited when I arrive at the Farmer's Market. I know that I'm in for some good food and I get to eat it outside in the sun in November! My choice is usually the Creole place for Jambalaya or Loteria Grill for some Mexican. 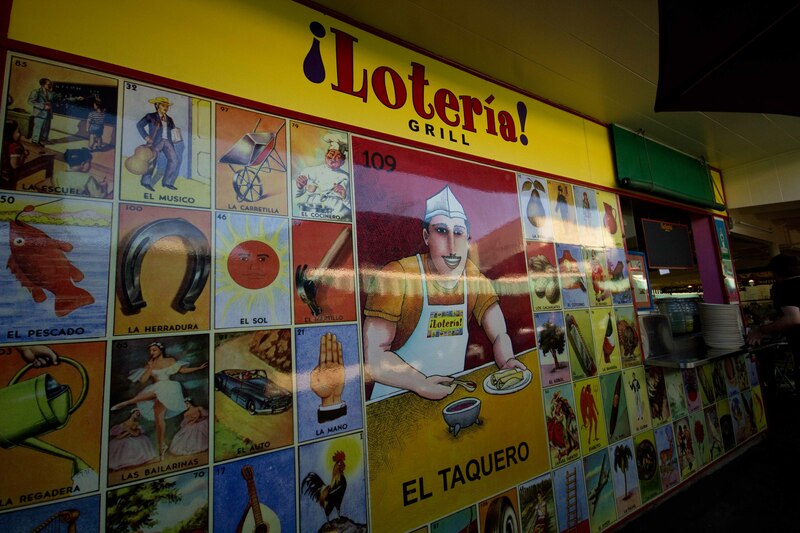 People say that Loteria Grill isn't real Mexican food, but it's the best & most accesssible in my bubble AND better than anything you can get in Vancouver. Normally I’d never order vegetarian tacos, but I once tried the taco sampler from Loteria and tasted all 12 of their offerings. I loved both of these so much I was craving them. 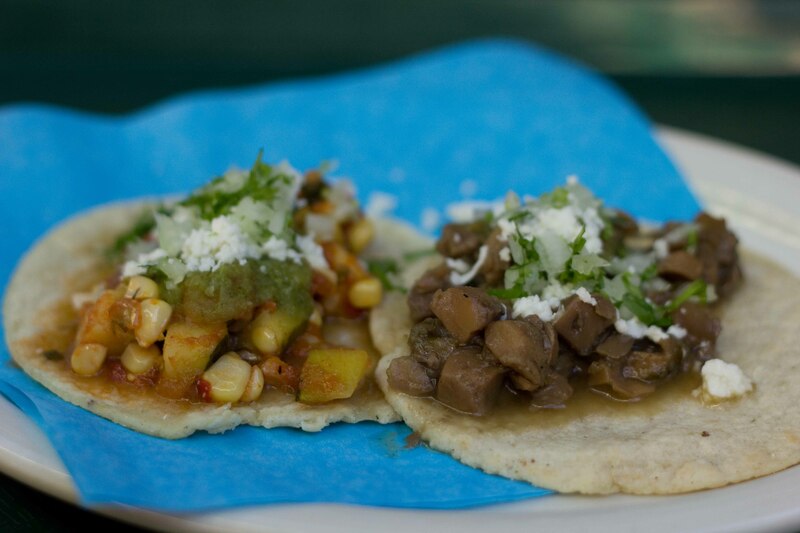 Calabacitas - fresh zucchini & roasted corn with salsa verde and Champiñones con Epazote both topped with queso fresco. The perfect small bites! I’m not much of a shopper, (I’d rather spend my time eating), but LA’s the place to buy my winter looks. On my solo day, I usually wander through the shops at the Grove for a bit and then choose one other area to tackle. Robertson Ave is usually my fav, but seeing as this year we’re staying in the heart of Beverly Hills, I thought I’d check out Beverly St and the big department stores… Barney’s, Saks and Neiman Marcus. Because I write about food, I won’t bore you with my shopping finds, but I will mention that I stumbled upon a “trunk show” at Barney’s and was served champagne, crab cakes and sliders while I browsed through a collection of haute couture. All this while I wore my Croc flip flops! Apparently, having the right attitude takes you a long way. My first few years of coming to LA, I was alone to dine for some of the evenings while Ben was out for business dinners. Back in those days, I’d find myself at a sushi bar like Matsuhisa ordering the most wonderful uni tempura and new style sashimi. For the past couple of years, I’ve been lucky enough to end my solo day with an evening with Ross’ wife Cathy. She takes an afternoon flight and arrives to meet me in the evening for dinner. She’s great for so many reasons, but especially since she’s game to eat anywhere. Last year we had a fun time at the Bazaar at the SLS hotel. I’ve wanted to try Animal for a long time, but whenever I showed Ben the menu, he was never that enthusiastic. Animal is an indulgent experience of all things, animal. All sorts of interesting body parts make it on to their menu; tails, ears, hearts, livers, sweetbreads. It’s this adventuresome dining that drew me to it. It’s exactly the same thing which turned Ben away. But Cathy was game and we dove right into their menu. 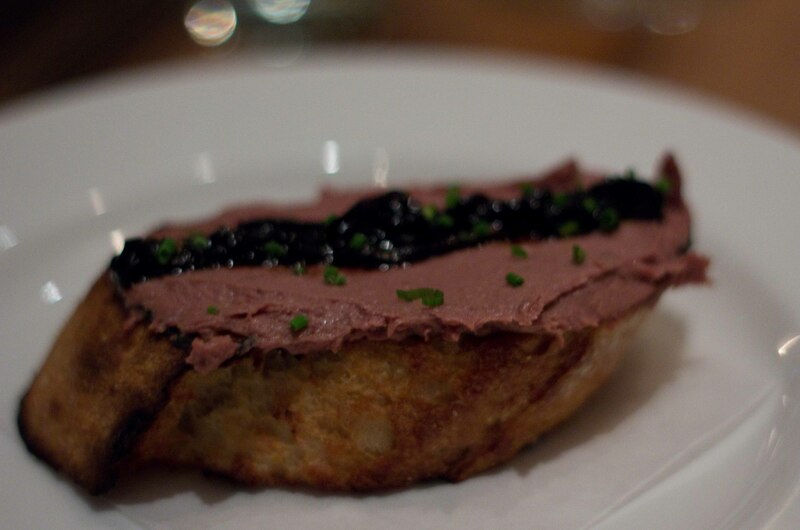 Chicken liver toast with a great liver to toast ratio. The balsamic/shallot jam on top cut through the richness of the delightfully smooth liver quite nicely. 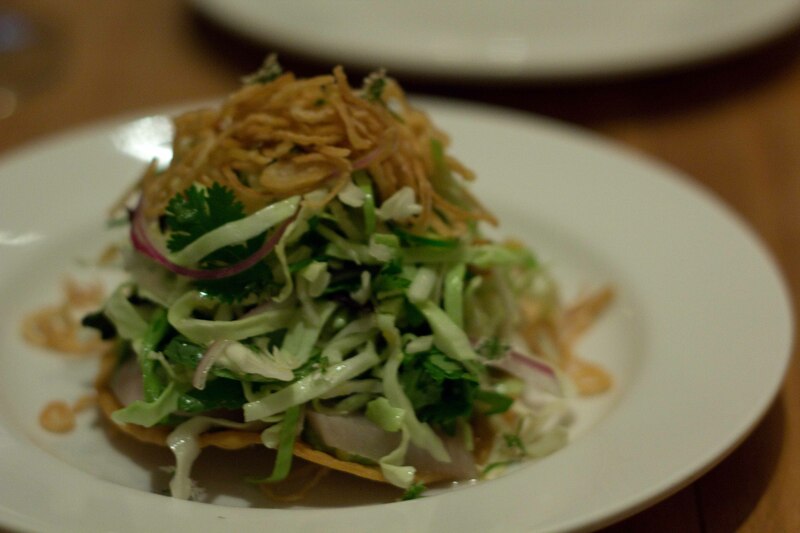 The hamachi tostada was by far the most delicious dish of the evening. There was a lovely crunch to the dish and the fish sauce pulled everything together perfectly. 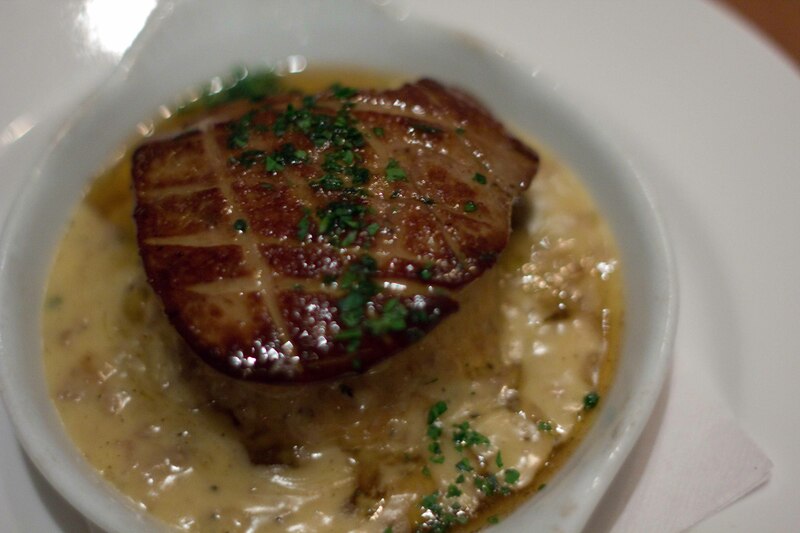 This generous piece of foie gras sat on top of a fluffy biscuit and rich maple sausage gravy. A dish better shared with 4 people as a few bites is all one needs. 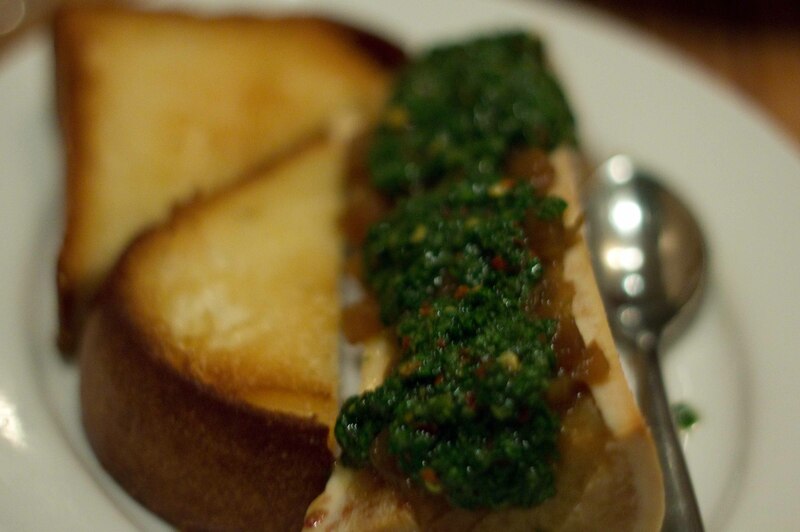 Try as I may, I couldn't get a good photo of the marrow bone with chimichurri and caramelized onions. Again, a great dish, but too much of it. 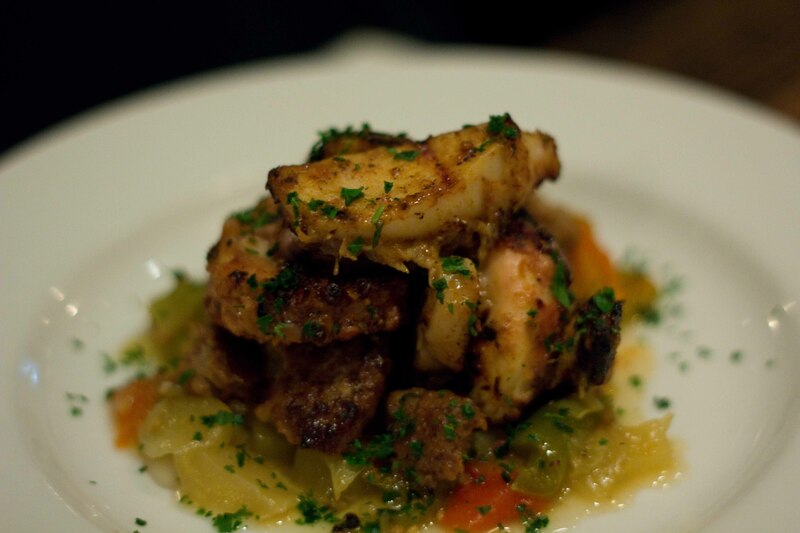 This octopus and chorizo dish was horrible. The octopus was over-cooked and the whole thing had a weird dirty bbq taste. We should have gotten the crispy quail instead. 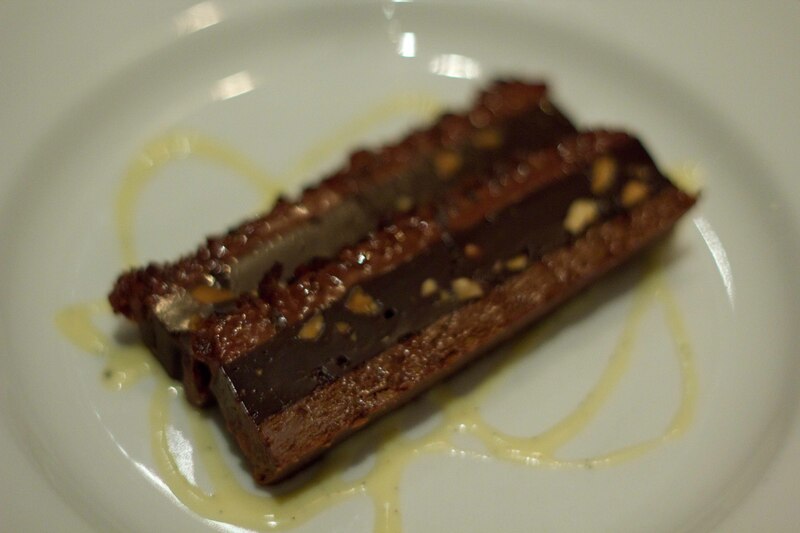 Animal's famous bacon chocolate crunch bar, a great save after the disappointing octopus and lived up to my expectations. My only complaint? Not enough bacon. As much as I like to have new travel adventures, there’s something so satisfying about a perfectly planned vacation day. My trips to LA are all about planned days, and my solo day in LA is always amazing.